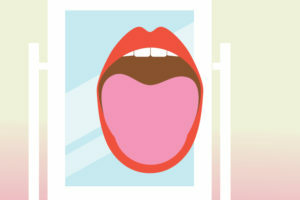 For clues about problems in your mouth, stick out your tongue and look in the mirror. A healthy tongue should be pink and covered with small nodules (papillae). Any deviation from your tongue’s normal appearance, or any pain, may be cause for concern. Family physician Daniel Allan, MD, discusses why you should watch for changes that might need to be evaluated by a doctor or dentist. Oral lichen planus: a network of raised white lines on your tongue that look similar to lace. “We don’t always know what causes this condition, but it usually resolves on its own,” says Dr. Allan. Vitamin deficiency: “Folic acid and vitamin B-12 deficiencies may cause your tongue to take on a reddish appearance,” Dr. Allan says. Kawasaki disease: a condition that can also cause the tongue to have a strawberry-like appearance. It is seen in children under the age of 5 and is accompanied by a high fever. “Kawasaki syndrome is a serious condition that demands immediate medical evaluation,” says Dr. Allan. Much like hair, the papillae on your tongue grow throughout your lifetime. In some people, they become excessively long, which makes them more likely to harbor bacteria. He says people with diabetes, taking antibiotics or receiving chemotherapy may also develop a black hairy tongue. Smoking: Smoking irritates your tongue, which can cause soreness. Canker sores: mouth ulcers. “Many people develop canker sores on the tongue at one time or another,” Dr. Allan says. “The cause is unknown, but stress is believed to be a factor.” Canker sores normally heal without treatment within a week or two. Dr. Allan says everyone should check their tongue on a daily basis when they brush their teeth and tongue. “Any discoloration, lumps, sores or pain should be monitored and evaluated by a medical professional if they don’t go away within two weeks,” he says.